When attmepting to load or unload a trailer of container with a forklift at a truck high loading dock, you will need to have one of three pieces of equipment to make the transition safely. You will eight need to have a DockPlate, a DockBoard, or a DockLeveler. 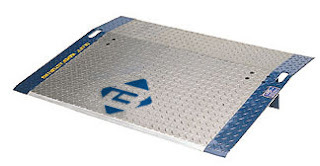 A DockPlate is a steel or aluminium plate with some type of locking leg and either hand hole or handles to move them. Plates are NEVER for power equipment. 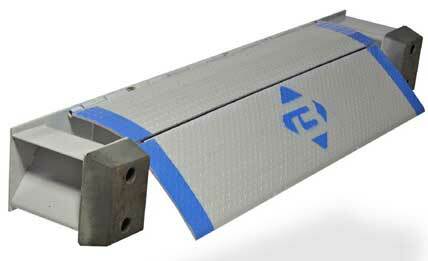 They are ideal for handtruck and pallet jack traffic, which is manually moved. They offer the lightest and most cost effective answer to your loading / unloading problem. If you are planning on making this transition with a powered lift device like a forklift, then you need to have a DockLeveler or a DockBoard. A DockBoard is similiar to a dock plate in that it is a steel or aluminum plate. It is portable. They differ from DockPlates but with the addition of structural components above the plate (curbs) and sometimes on the underside as is the case with rail boards. There are different types of locking devices from fixed legs to drop pins or locking rings.DockBoards are for forklift and other vehicle traffic. They are best specified by an expert who can take all aspects of your application into consideration. The third piece of equipment is a DockLeveler. This is a perminantly installed device. DockLevelers correct height differences between loading docks, loading platforms and truck or trailer beds. They are installed on your loading dock edge and dock leveler is positioned by lifting a self-storing handle and pulling the handle to the dock floor. The latch assembly activates the lip forward to the floor of the trailer as the handle is lifted. When released, the handle automatically returns to a stored position. Using one of these devices is critical to your safety when operating a forklift around a loading dock. If you are not sure about which one is right for your, make sure to consult a forklift professional. Discussion on the sues of this equipment is a vital part of any forklift safety program. So make sure you cover these items in your forklift Safety Certification Program. This looks very sturdy and safe to use, thanks.